Can DNA genealogy give you the name of his parents? Can DNA genealogy solve the family tree mysteries of your brick wall ancestors? Can a DNA test tell you where your 19th-century second-great-grandfather was born in Ireland, or the names of his parents? Can it add whole branches of new surnames to your family tree? But, not in the way you might think. The Ancestry DNA test delivers its results in three sections – your DNA Story, your DNA Matches, and your DNA Circles. This post begins a three-part series analyzing the DNA results I received from Ancestry. Everyone’s DNA results are unique to their genetic make-up; so, your results will vary. In this post, we cover Ancestry’s first section, the DNA Story, which is where Ancestry presents your Ethnicity Estimate, or its best guess at where your ancestors of the deep past called home. It looks like a VCR tape. 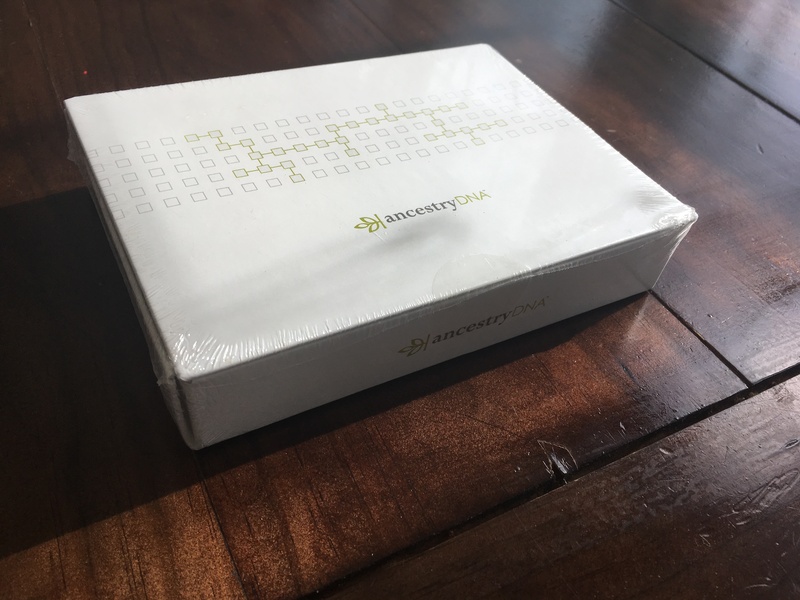 When the Ancestry DNA kit arrives, it kind of looks like a box holding a VCR tape. That was my first thought when I saw the unopened Ancestry DNA kit on my table. And, it truly is a mastery of marketing – selling itself as much as a product as it is a service. The box and its contents are wonderfully laid out, with simple, easy-to-follow instructions. But, in the end, it is a service. You open the box, spit into a tube until it’s full, seal it, and ship it back in Ancestry’s postage-paid envelope. Then, you wait one to three months. It’s really that simple. When you throw the rest of the packaging away, you’re left with a service, but what a service it is! It’s genealogy for the 21st century. Use Ancestry’s DNA Circles feature to see which common ancestors some of those relatives from your DNA results share. But, like anything in genealogy, you only get what you give, and you have to give some effort. Ancestry DNA doesn’t hand you the answers to your brick walls, the names of your distant ancestors, or any promises that your distant cousins will ship a box of old photos, each neatly labelled, to you. Like conventional genealogy, DNA genealogy delivers personalized results that vary greatly from person to person, based on varying parts skill, effort, and luck. DNA genealogy delivers personalized results that vary greatly from person to person, based on varying parts skill, effort, and luck. Onto ethnicity – Your family tree is likely more complicated than you thought. Insight #1: You probably won’t guess your DNA Ethnicity Estimate correctly. Years ago, in grade school, I got my first family tree project. I was in sixth grade, and our history teacher passed out sheets of paper with an empty family tree on each. She gave us a week to get as far as we could in filling it out. Some kids came back with family trees going back to the Mayflower. Others came back with a shrug and a tree with their grandparents’ names and some guesses at their birthdates. Even before the project, I knew that my father’s ancestors came from Ireland, and that my mother’s came from Portugal. So, I knew that I was 50% Irish/50% Portuguese; right? Now, there are research papers, whitepapers, and scholarly articles out there that will explain how the 50% of DNA you inherit from each of your parents results in a DNA mixture that’s unique to you. This is why siblings who share parents don’t even get the same ethnicity estimates. But, that discussion extends beyond the scope of this post. But, even with that said, I was kind of shocked that I got just 8% of my DNA from the Iberian Peninsula, home to both Portugal and Spain. Just 8%? That’s about as Portuguese as Richmond, Virginia, or, maybe Indianapolis, Indiana. Sure, there must be some people of Portuguese descent in those places, but 8% … just doesn’t seem very Portuguese. If you’re thinking that my 10% Europe South ethnicity estimate might be hiding some Portuguese, it probably isn’t. In Ancestry DNA parlance, Europe South is Italy/Greece. That doesn’t necessarily mean I have a hidden Italian great-grandparent. It more likely means that enough of my mom’s family had ties to the Roman empire (which included the Iberian Peninsula’s modern-day Spain and Portugal) that Roman DNA persists into my generation today. Beware the Vikings – for they are us! And, in my DNA results, I got 15% Scandinavian. That’s more Scandinavian than my wife, who has great-grandparents who were born in Sweden. It’s also more Scandinavian than Portuguese and half of my family tree traces its origins to Portugal. But, climbing higher into my family tree, into the 1900s, 1800s, and even into the 1700s and 1600s isn’t revealing any Swedish, Norwegian, or Danish ancestors. There are just way more Manuels, Joãos, Joaquims, and Marias than there are Sörens, Svens, and Elsas. So, where does the Scandinavian DNA come from? The answer actually lies more in the ancestors of my ancestors. The Scandinavians were sea-faring travelers – most remembered as the fearsome raiders of the medieval seas. However, they were also merchants and tradesmen. In many cases, they settled in new lands and became more native than the natives there. From Ireland: Viking raids into Ireland began in the last years of the 8th century and kept on coming for more than 200 years until Brian Boru’s defeat of the Vikings at the Battle of Clontarf in 1014. Before Boru, though, early tenth-century Vikings began establishing settlements in Ireland; some of these even developed into present-day Dublin, Cork, Waterford and Limerick. And, the Normans, Viking descendants themselves, invaded Irish shores during the late 1100s, helping establish a period of English rule in Ireland that persisted some 800 years. Traces of the Vikings can be found today in their Irish descendants and in Irish surnames such as Cotter, Jennings, and Broderick. From Portugal: Portugal may seem an unlikely place to look for roots in Scandinavia. But, again, in examining DNA results, the real insights come when you consider the ancestors of your ancestors. My Portuguese ancestors came from the Azores, a chain of nine islands in the North Atlantic ocean. Even though the Vikings appear to have left their mice in the Azores early on, the islands were uninhabited when the Portuguese arrived to their shores in the early 1400s. Shortly thereafter, the island was heavily settled by mainland Portuguese settlers and more people from Flanders, France, and Spain soon followed. Add to these slaves from Africa and Sephardic Jews fleeing the lesser-known Portuguese Inquisition and you start to see the melting pot that Azorean genealogy can grow to represent, and a few of the possible origins of that Scandinavian DNA you find there today. The British are already here (inside us). I once had a boss whose parents had emigrated from Co. Limerick in Ireland, back in the 1920s. Through childhood osmosis, he hated all things British. Sure, the British, for generations, centuries even, oppressed the Irish. But, he had this story – where his parents as young children were forced to eat from chipped plates and cups because the finer, or at least not broken china was reserved for the non-Irish. That boss had no patience for anything British – royalty, tea, biscuits, even British Airways. And we flew from Boston to London several times a year back then. Will DNA testing help you find redcoats in your family tree? My dad’s family comes from Ireland too and identifies as Irish Catholic, but digging into our ancestry, one large branch comes from County Monaghan up near Ulster in the north of Ireland. And, that branch had one redcoat and was, gasp, Presbyterian. They probably had some 16th century ties to Scotland, Wales, and the Plantations of Ulster too. So, there’s some British DNA (by Ancestry’s groupings anyway). Another branch of the family left Co. Roscommon in the early 1840s, and went to live in Manchester, England for a generation. What does all that mean? I got 12% of my DNA from Great Britain. And, there are some British ancestors with birthplaces in Scotland, Wales, and England somewhere back there. DNA Genealogy is in its infancy. But, there’s a long way to go. The ethnicity estimate tells you where you ancestors were thousands of years ago, but it won’t tell you who they were or exactly where they lived. But, the results will show you how empires of the distant past influenced your DNA ancestry and your ancestors – like the Romans conquering the Iberian Pennisula, or the Vikings settling parts of Ireland. It’ll also put long-held family identities to the test. Even if all of your maternal ancestors came from Portugal’s islands hundreds of miles away from anywhere else in Europe, the results will tell you if some of those islanders in your ancestry may have been immigrants themselves to those islands hundreds of years ago. And those results may challenge how you define yourself. The ethnicity estimate tells you where you ancestors were thousands of years ago, but it won’t tell you who they were or exactly where they lived. Do I still tell people I’m half-Portuguese and half-Irish? Yes. Because that’s still true, culturally. And, it’s still true that half of my RECENT ancestors came from Portugal and half came from Ireland. Also, all this is much easier than explaining that I’m 47% Irish, 15% Scandinavian, and 38% other things. The fascination with defining ourselves by naming the countries of our ancestors isn’t something I noted when I lived in Europe. But, seeing all the mixing suggested by my DNA results, I start to wonder if, maybe, the mixing pot or the patchwork quilt that defines America today could also define our ancestral homelands beyond our shores as well. Thank you, Ryan. Very well done, as always. Interesting to learn more about my maternal side of the family from the Azores (San Miguel). Thank you! Hi Jeanne – thanks! Azorean genealogy is a lot more complex than it can seem at first glance. Good post! I have totally seen some interesting DNA results with the various tests that I have used on my family.